"What’s the difference between a Bay boat and an ocean one?" "How much does one cost?" "What would we do with the house, our careers...the dog!?" These were just some of the questions we asked aloud as we sat at anchor in Cornfield Harbor off Point Lookout, Maryland, on our Catalina 22, August of 1991. We had bought the Catalina, our first boat, just three months earlier along with a copy of the Annapolis Book of Sailing for a thousand dollars. I don’t know exactly what possessed us to get into sailing, but life hasn’t been the same since. We both had the summer off in ‘91, my wife Liz being a teacher and I, a professional musician. We pretty much lived on board for the next three months. After using four gallons of Clorox bleach on the boat (when we first trailered it to the marina, people thought it had sunk), we then started with chapter one in "The Book". "The Book" taught us how to raise the main, reef, kedge off (practiced regularly), anchor, and follow a compass-- the skills we still use 99% of the time. Our goal for the summer was to put the nose of the boat into the Atlantic Ocean, which we did in August. We then immediately jibed, and headed back to the relative safety of the Chesapeake Bay. Although a single summer is not a long time to learn sailing, we realized we probably had done more, had more adventures, and had made more mistakes than most people get the chance to do during several years of "weekend sailing". Most boaters in our marina had owned boats for 6 or 7 years and had never even anchored out, much less followed compass courses through the night from buoy to buoy. We had been able to do several one to two week long cruises, in all types of weather, traveling over a hundred miles away from our home marina to places where "there be dragons". Not that we felt like accomplished sailors at this point. There was just always the desire to know "what’s around the next bend?" and "what if...? ", and "wouldn’t it be neat to...", that provided the realization that our present boat wasn’t the one to take us there. As far as the house was concerned... rent it. Our careers...quit (life is short). Money for this "ocean capable" unknown boat and a cruising fund?...sell the cars and furniture. The dog? Oh no! Not Auckland, our Husky/Shepherd best friend in the whole wide world! We would give Auckland away to friends on a nearby farm. Our one decision we would regret forever. Finding good, reliable information about what makes a good, blue water boat, was our next goal. Boat brokers laughed at us upon discovering our limited experience and money. Whatever ocean going boats cost, we needed one with an EPIRB, self-steering, life raft and dinghy for no more than $15,000. One broker would not even show us any boats saying he "wouldn’t get caught out there in anything less than a forty footer." (I guess that’s why he’s inside selling boats instead of cruising!) We read books of all kinds: Chichester, Hiscock, Tristan Jones and others, then found Dan Spurr’s Upgrading the Cruising Sailboat. Recognizing our own inexperience, we wanted a boat that would hold up when we didn’t. We liked the arguments for a full keel, heavy displacement boat over fin keeled, lighter displacement ones that according to some books could "out race storms". Later, we would learn that a thousand miles from land, in 40 knots of wind is not the time to rethink your boat buying decision. Or, maybe that is when you rethink it! We looked mostly at Pearson Vanguards but could never find one within our limited, but hopeful, price range. Finally, in Beaufort, South Carolina, a Triton was advertised that fit our qualifications to a tee. 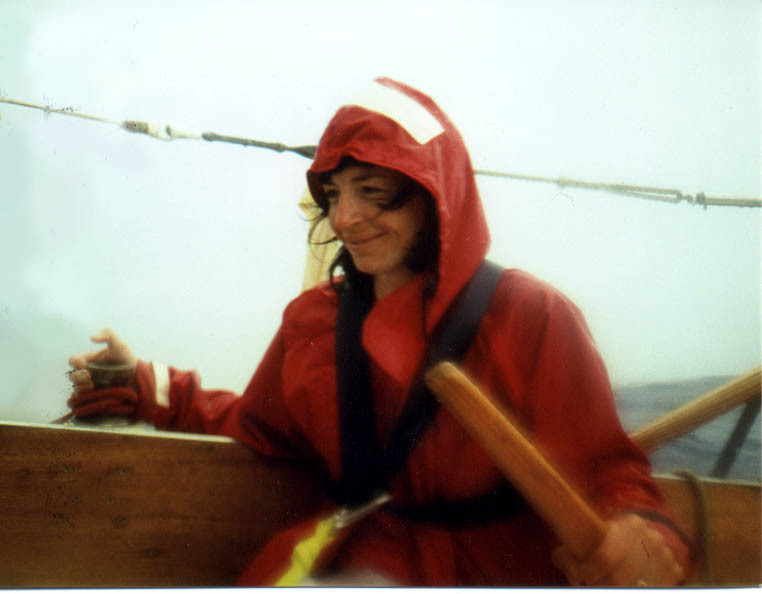 Tosca had a life raft, EPIRB, RVG wind vane, oversized rigging, 5 anchors, a new Universal 18 HP diesel, a storm jib and trysail, a lead line, and a set of around the world charts! We had found "The Boat". A whole book could be written about Tosca’s owner, but in the few hours I spent with "Mike" closing the deal, he gave me some serious, heartfelt advice that became the foundation for our "style" of cruising. He said, "Go and go alone". He didn’t want us to go with a group of boaters, didn’t want us to make our sailing and weather choices based on a group mentality or leader, didn’t want us to lean on another boater’s expertise rather than learn it ourselves, and most of all, didn’t want us to miss out on the experience of it all. We didn’t Mike. Thanks. 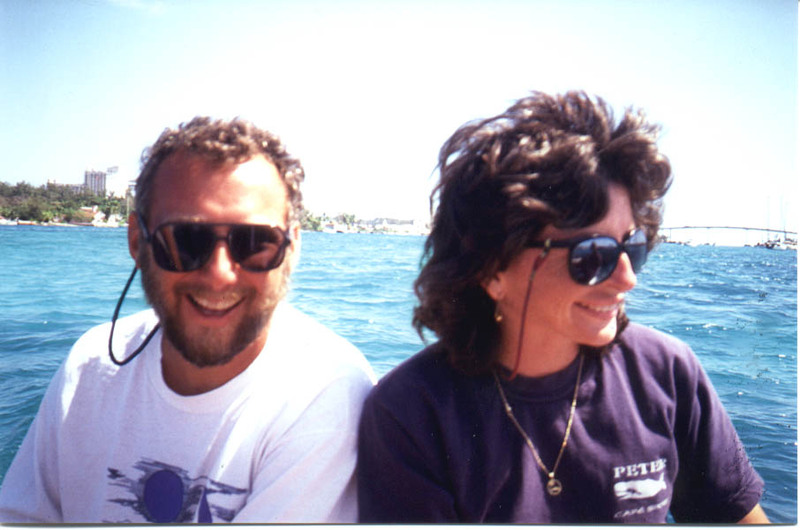 We left our home marina in Kinsale, Virginia off the Potomac River on June 4th, 1993 after learning to sail two years before. We changed the name of Tosca to Different Drum both because I had been a percussionist for the last 15 years and because of Thoreau’s essay, "If a man does not keep pace with his companions, perhaps it’s because he hears a different drummer..." I had re-rigged the boat using Staylock terminals and oversized rigging, added a 22lb Bruce anchor with 100 feet of 5/16th chain, (a 25lb CQR and 3 Danforths were already on board), put a Rutland wind generator on an 8 foot aluminum pole off the port quarter, built a 2 cylinder propane box and mounted it as a table in the cockpit sole, bought a GPS (also had an RDF, sextant, and lead line, all of which were used), and a new VHF (we couldn’t afford any long distance communications). We weren’t entirely sure where we were headed or when we would come back. How much did cruising cost? We didn’t know. Would we get scared and turn around? Maybe. We had a lot of "book" knowledge, but was that enough? Would the boat last? Would we? We had no false expectations of either our ability or experience. We decided we would go as far as we felt comfortable and turn around anytime we wanted to. The general plan was to go to Bermuda then down to Antigua and island hop down to Venezuela for hurricane season. That would give us two separate weeks at sea, and we figured by then we would either feel like going on or buying plane tickets back. In our wildest dreams was the South Pacific, and we had all the charts and cruising guides on board with that in mind. Fate had other plans. It took us 7 days to travel the 75 miles down the Chesapeake Bay due to constant engine problems. Once we got towed into a marina by a local crabber to buy some fuel line. I’m not sure what he thought when we said we were on our way to Bermuda! Two days later we left Norfolk, Virginia bound for Bermuda when the engine died again in the middle of 5 huge container ships coming into port. In total frustration I screamed, " IT’S A SAIL-BOAT...we’ll fix the engine on the way!" In light winds, slowly through the remainder of that day and evening, we saw the Virginia coast disappear. We will never forget that first night at sea. As the coastal lights grew dim, I put on Sandi Patti’s CD, "La Voyage". I held my wife in the corner of the cockpit under the dodger as close as I’ve ever held her and we both cried. We wept for our dog, wept from the stress of a year of preparation and doors we closed, wept for missed family and wept for the fear of the unknown. All that, though, would soon change. We began the routines that we would hold to for the next fourteen months. We ran four hour watches, checking the horizon every 10 to15 minutes. We wore harnesses whenever we were alone on deck and always at night. I had run jack lines out of 1" tubular webbing, and you could get around everywhere on deck and still be hooked in. We also were able to clip in to eyebolts before even leaving the cabin from down below. One of our rules was that if the on watch person had to do a sail change (all hank ons) or leave the cockpit during the night for any reason, the off watch person had to be awake, in foul weather gear, and harnessed up ready to go if needed. We kept the life raft under the hard dink which fit perfectly upside down between the mast and dodger. If we had to abandon ship, it was my job to get the life raft while Liz set off the EPIRB and grabbed the abandon ship bag near the ladder. Two 6 gallon jerry cans 9/10ths full of water (to float) were attached on deck by the cockpit coamings and tethered on 15 feet of line. If there was time, we would try to get one or both of them. Different Drum did great all the way to Bermuda as the captain and crew adjusted to life inside a washing machine. The engine problem got fixed. A kinked and collapsed fuel line and a lot of water in the fuel we picked up at our home marina! On the fourth day we had a gale and hove to for several hours just to get some rest. I didn’t really trust the GPS yet (How do you know it’s telling the truth if all you see is water?) but was able to pick up a radio tower located in Bermuda on the RDF. On the eighth night out we saw the lights of Bermuda. We hove to the rest of the night to make a daylight entry. To get our passport stamped with "Entry by sea" by Bermuda Customs was the best reward we could get for all our struggle. "Entry by sea"-- how cool! Bermuda is where our destiny changed. First we met Herb Hildenburg, the famous weather forecaster who, through his own generosity and interest, relays forecasts to hundreds of boaters on a daily basis. It was Herb who advised us not to head south to the Caribbean, that it was too late in the season (hurricane season) to risk the trip. He also advised us as to what type of receiver to buy so that we could pick both him and other weather info up in our continuing travels. We tried to learn as much as we could about weather forecasting in the short time we had with him. Our second destiny adjustment came from meeting John and Karen on Here and Now a 28 foot Cheoy Lee out of Florida. They were headed across the Atlantic for the Azores because they heard you could get dinner and wine there for four dollars! We became fast friends and they soon had us considering the Atlantic. We didn’t have charts or warm clothes, but our only other option was to return to the Chesapeake for hurricane season. Besides, it’s only 2,300 miles. Three times what we had just done. What about the Pacific? Three days later we left. After two days of trying to stay close but not too close to Here and Now and after remembering what Mike had told me, we radioed John and Karen, told them we’d meet them in the Azores and altered course a few degrees. It took 21 days from Bermuda to the Azores and during that time the Atlantic gave us everything. 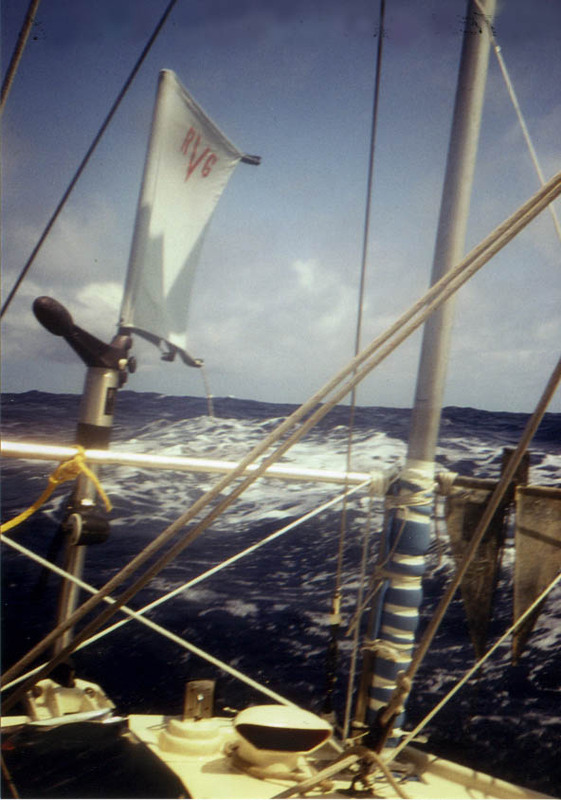 We were mostly in 15 knot winds off the quarter under genoa and full main, but often under storm jib alone. Weather patterns blew through non-stop. I sometimes did 10 to 12 sail changes in a 24 hour period. 10 knots of wind for three hours followed by 35 knots plus. Then back to 15 knots down to 5 then up to forty! Other days were simpler. We heard Here and Now call in daily to Herb in Bermuda for weather info. At that time Here and Now gave their latitude and longitude, so we always knew where they were even if they didn’t know our location. We were a couple of hundred miles ahead and north of Here and Now when we heard them tell Herb that a shroud had parted, and that they would not be able to keep in communication due to battery charging problems. We decided to turn around and try to find them. Knowing their lat and long once a day from their call in to Herb, we then estimated their speed and course. From that we drew several different scenarios based on different speeds and directions. If we guessed right and had a large amount of pure luck, we’d be to them in a couple of days. The morning of the second day the wind died completely and the ocean surface became glassy calm. I wrote in my log book, "Today is when we should see John and Karen. If we do, it will be a miracle!" Later that morning we saw a spinnaker off on the horizon. We motored toward it, and as we got closer we could tell it was Here and Now. We quickly ran below, put on our Groucho Marks glasses, pulled along side and asked if they had any Grey Poupon. Neither of us had seen another boat since we’d left Bermuda over a week ago. John had solved the charging problem and jury rigged the shroud no problem. After a half hour of "catching up," we decided to go over to their boat for dinner as we had so many times before in Bermuda. There wasn’t a breath of wind and the surface of the water was so still you couldn’t see where the horizon started or the ocean ended. An awesome contrast to days before. Liz made dessert, a one inch thick chocolate chip cookie, then we took off the dinghy and rowed over to Here and Now. Our boat wasn’t going anywhere. It was so good to talk to John and Karen and compare experiences of the past week. Toward nightfall we said our good-byes, again promising to meet in the Azores. It was strange and surreal to be rowing our dinghy in the middle of the Atlantic Ocean back to Different Drum. It was to become one of the many experiences of that year we couldn’t find words to describe. We arrived in Horta on the island of Fail in the Azores on August 2, 1993. Here and Now arrived a few days later. There were cruising boats from all over the world. Other than a 27’ Vega, we were the smallest boat there. When we told the customs agent we had been at sea for 21 days, he just shook his head and then warmly welcomed us to the Azores. The local people treated us and all the boaters with extreme hospitality everywhere we went. Theirs is a seafaring community, and they have respect for anyone crossing an ocean to visit their islands. Weather wisdom says to leave the Azores no later than September 15th before the winter northers blow in, but we couldn’t pull ourselves away. We had made lots of friends, drank gallons of incredibly strong local coffee, ate goat, climbed volcanoes, and as is tradition, painted our name and logo on the wall of the harbor. We reluctantly untied our docklines September 20th, after all the other boats had left. John and Karen fell in love even harder with the Azores and stayed behind. It was a sad goodbye. Most cruisers were headed for the Med 978 miles away and since we were so far off our original game plan, we did too. During the next 36 hours, however, we were constantly hit broadsides by waves and were cold and wet. Looking at the chart we decided anywhere south had to be warmer and it would put the wind on the quarter. We adjusted the wind vane, turned, and headed for the tiny island of Porto Santo 448 nautical miles away. Porto Santo looks like a lunar landscape. It’s beautiful in its bareness. We were there 7 weeks at anchor and never had to run the engine to charge batteries because of the wind generator. The 20 foot seawall that surrounds the harbor is open to the southwest because storms "never" come from that direction. After about four weeks, we decided to move on to the Canaries off NW Africa about three days away. I cleared out with customs, and Liz and I both took a last look at the weather chart posted on the wall. A very small, weak low pressure system was over the Canaries. We were anxious to move on, but again one of our never to break rules stopped us. We knew we couldn’t pick the weather once we were "out there," but we had decided never to leave port unless things looked perfect. This was a hard choice for us as I wasn’t really concerned about the weak low and we had been here a month already. We decided to stay only because I didn’t want to arrive in unfamiliar waters during what looked to be a light drizzle. Thirty-six hours later, we were hit with what would become Porto Santo’s "Storm of the Century." People died on nearby Madeira Island, boats were lost and for two and a half days, we stayed aboard Different Drum trying to keep from dragging onto the rocks 20 yards behind us. The storm came right through the harbor entrance with 8 and 10 foot breakers and over the 20 foot high seawall. Moorings broke, anchor chains snapped, and one boat dragged past us onto the rocks. We ran the engine in forward gear to keep some of the strain off our ground tackle. We were lucky. We lost our dinghy, but gained even more confidence in our little Triton. The next two weeks were spent bargaining with a Portuguese fisherman for his wooden dinghy and helping other boaters do repairs and search for lost anchors. We still have our Portuguese fisherman’s dinghy. We left Porto Santo and beat to windward for three days in 25 plus knots of wind to arrive in the easternmost Canary island, Graciosa. We had wind gusts of 40 knots, but made our best speed ever doing 6.5 knots under storm jib and deep reefed main. We did 135 nautical miles per day for three days on a boat that normally did a100 miles per day! After being hit broadsides by a particularly vengeful wave, Liz said to me, "Jeff, are the lifelines supposed to be under water?" We were glad to have storm boards over the windows. In the 14 months total time we were cruising, this was the only time we beat to windward! Although Liz and I usually felt a little queasy our first few days of each passage, this time we had "mal de mer" to the extreme. We sat beside each other in the cockpit and just passed the bucket back and forth and over the rail, back and forth and over... Because of this beat to windward, most boats don’t go to Graciosa and pick another Canary island further downwind. We were rewarded, though, by being the only boat there, anchored off a pristine beach inhabited only by the occasional ... camel! Like so many other experiences of the trip, it just seemed unreal. We were low on propane, though, and in a few days moved on to the other, more metropolitan islands of the Spanish Canaries. We stayed in and traveled about the Canaries until mid January. We had Thanksgiving dinner with Keith on Reliance, the only other American boat in harbor. Keith was singlehanding a NorSea 27 and was disappointed to find out we were 28 feet in length. He said he was always the smallest boat in harbor and wanted to just once be "bigger than someone else"! 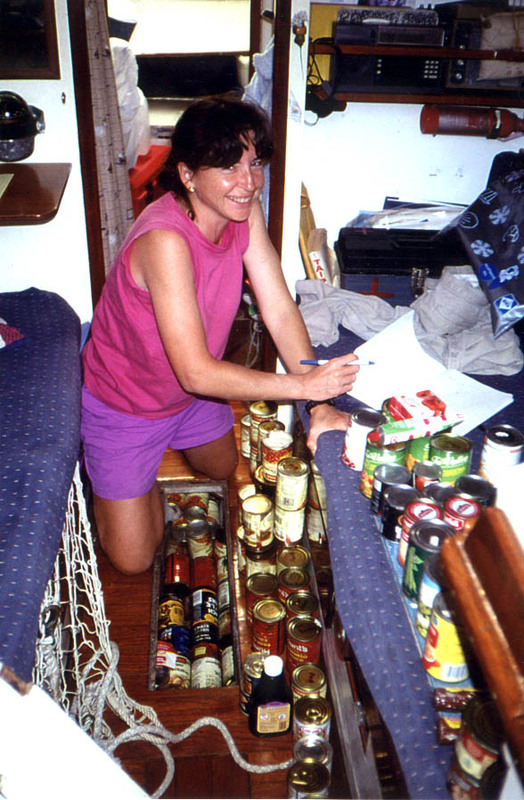 On January 25, 1994, we reluctantly untied our dock lines to begin our longest voyage yet, 2800 miles to the Caribbean. The log book reads ..."1130 hours. Leaving Puerto Mogan, Gran Canaria in a few minutes. Scared, anxious, and ...looking forward to starting!" Winds had been blowing force 8 (34-40 knots, 18-25 foot waves) for weeks around the Canaries. When they finally dropped down to force 6 and 7 (up to 33 kts. and up to17 foot waves), we left. By now our definition of "heavy weather" had changed considerably. We had been in so much rough stuff during the past 7 months with our Triton that 25 knots of wind seemed like a normal day. Because of the wind block from the island, we actually motored most of the first day. It was dark, of course, when the wind finally filled in from ENE, a steady 25 knots. We were on our way. We were finally in the "trades" we’d read about. January 26 Log entry: "1200 hours position 26 degrees 41 minutes N, 16 degrees 51 minutes W. Winds ENE 20 kts. Seas lumpy. 2691 nm to Grenada, course 268 degrees. 5 knots under jib alone." It would be like that most of the trip. During one 10 day period, we did not touch the tiller or wind vane or adjust a single sail or sheet once! The wind was that steady both in strength and direction. We were both down below with the hatchboards in when "KA-BLAM"! I thought we had hit something. I slowly slid back the hatch expecting to see the wind vane and wind generator torn away and saw the cockpit full of water draining through the scuppers. We had been "pooped"! One of the reasons we had picked a Triton was because of the reserve buoyancy in the stern and a smile came to my face as I realized the long overhanging stern had done its job. Because we were in big, following seas, we often kept the hatch boards in with the hatch open just 6 inches. 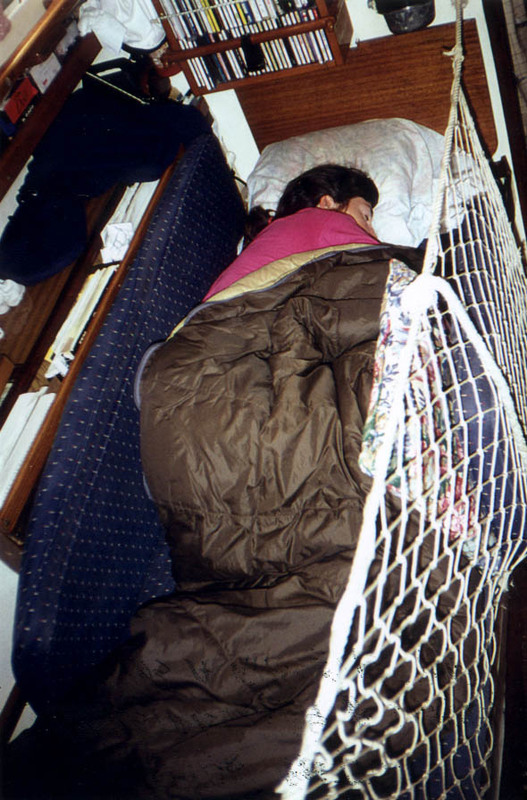 Liz had just settled in below for a nap on the starboard settee when a wave came over the stern, through the 6 inch opening, soaking Liz in her sleeping bag. I, outside in the cockpit, remained perfectly dry. That probably explains why about a week later Liz commented, "You know you’ve been at sea too long when your bra begins to rust!" Halfway across the Atlantic the sky turned hazy and nearly blocked out the sun for 2 days. Red dust settled all over the boat and in the sails. Later we learned it was the remnants of a Sahara Desert dust storm 1,200 miles behind us. It took us 28 days to cross the Atlantic making landfall in Antigua. We had only seen two boats that entire time, one freighter and a tug pulling an oil rig. Landfalls are funny. They are the "goal" during the whole trip and yet, that first sighting of land reminds you that you’ve been OK and your boat has kept you safe through it all. Land on the other hand is ...is HARD. So what if you’ve been at sea for 28 straight days? Land can put holes in your floating home. With great reluctance we entered the harbor. The first cold coke with ice in it changed everything. From there we did traditional routes up through the rest of the Caribbean, St. Martin, British/U.S. Virgins Islands, Puerto Rico, Turks and Caicos, Bahamas, then Florida. We came up the ICW to Virginia. A group of friends were waiting and waving on the fuel dock of our home marina from where we had left 14 months before. As if the Atlantic had not humbled us enough with its fury, we ran hard aground, 50 yards from our dock. The world travelers had come home. Would we do it again? Absolutely. Would we do it in a Triton? Possibly. It is and was a "wet" cockpit boat. It would be nice to be a little dryer next time. We always felt safe in our Triton. When we were scared, it was because we didn’t know at the time if it was going to get worse. The only things that caused us problems or broke were things that should not have been on the boat in the first place due to age or quality. Different Drum didn’t feel small at sea, but it was beginning to feel small at anchor so for us, 14 months was perfect. If we had the option to go now with a Triton or wait years to buy and outfit a larger vessel, we’d go now!